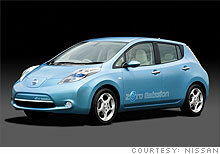 Your fancy new green machine is parked in the garage, but how are you going to charge it up? These vehicles top their classes in fuel economy while offering strong performance, too. NEW YORK (CNNMoney.com) -- If you're looking forward to parking a brand-new electric car in your garage soon, be prepared to spend some money getting that garage in shape. Electric cars like the Nissan Leaf and Chevrolet Volt ideally use special "quick chargers" that have to be hardwired directly into high-power lines. Installing the chargers is not like putting in a ceiling fan. The equipment has to be fully approved, installed by a competent professional, and in most cases, a city or state inspector will have to approve it all. You could plug your car into an ordinary wall socket, but not if you're in a hurry. 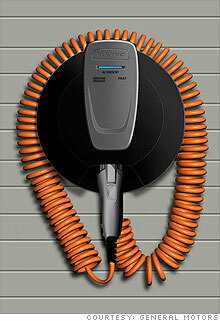 Charging a Nissan Leaf would take up to 16 hours, and charging a Volt would take eight. With a quick charger, the job for either would be done in just a few hours. The Volt can also run on gasoline, but what's the point then of having an electric car? Last summer, BMW rolled out an experimental fleet of 450 Mini-e electric Mini Coopers in the Los Angeles and New York City areas. Unfortunately, by the time the first cars were being delivered, the quick charger equipment had not gotten an official seal of approval from the consumer safety group Underwriters Laboratory, something that's required in many localities. "It took us a little longer than we anticipated," said Rich Steinberg, BMW's director of electric vehicle operations. Dr. Lyle Dennis, who lives in suburban New York and commutes to his medical practice in New Jersey, leased one of the Mini-e's and said it took about a month for him to finally get his charger installed and approved. But really it wasn't that inconvenient, he said. He just plugged the car in to a regular outlet for as long as possible, which gave him enough power to get work, where he plugged it in again to fill up for the trip home. "I was able to drive it pretty much every day," Dennis said. But those who were affected by the glitch are also the ones most likely to forgive, said Sebastian Blanco, editor of Autobloggreen.com. "The people in the [electric car] community, they certainly know about the problem," he said. "but they're also the ones that are the most excited about electric cars." Dennis, for instance, runs two popular electric car blogs -- gm-volt.com and allcarselectric.com -- in his spare time. But the broader market of car buyers are likely to be turned off by any additional hassles, said Charlie Vogelheim, executive editor of Intellichoice.com. "They all become detriments to making the sale," he said. "That's the type of thing that slows it down going into the mainstream." Cars like the Chevrolet Volt and Nissan Leaf, which are expected to hit the market late next year, aren't expected to sell in large numbers, and they probably won't be profitable for years, but they're key for good public relations. The media and the general public will be watching and waiting to see how well they're received. Nissan and GM have been working with city and state governments to prepare them for the arrival of electric car so their customers don't hear, "You need your what inspected?" when they call city hall. Both automakers are also working on public infrastructure for electric cars. But they admit that parking lot charging stations are more important for creating public acceptance of electric cars -- to do away with worries about running out of juice -- than for actual use. "We believe that 80% of charging is going to happen at home and at the workplace," said Mark Perry,director of product planning for Nissan. How little setbacks, problems and hassles will affect public acceptance of electric cars ultimately depends on how the auto companies handle these issues as they arise, said Blanco, but he sees change coming no matter what. "Little setbacks will not be enough to hold back the tide of people who really want these cars," said Blanco.